Remember back to the days when we took photographs with a single-function device? Perhaps you still have one from before we all went digital and you still produce actual photographs to hold and look at. 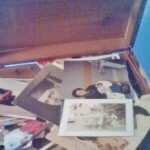 Over the years I accumulated hundreds of photos and fully intended to put them into albums. I had been a diligent mother of a young child, documenting my daughter’s baby and toddler years, affixing the school and birthday party photos into dated albums up through the Third Grade. But the rest of them: me, my friends, the holiday celebrations and vacation, were still in their yellow Kodak envelopes, with the negatives neatly tucked in front and stashed into a large bin to await the eventual transfer to the appropriate album. Most of the envelopes were labeled although there were a more than a fair share where you had to grab a photo and see who was in it, from what era, what event that was being documented. Do I need to admit they never got into the empty albums waiting for them? The bin was capacious, I kept tossing the envelopes into it and then tucked the whole thing into a closet to wait for the day when I finally had time to go through them and decide what to do. Years passed. I went digital. I only printed selected photos to share with family or friends. No more total rolls with the odd image that nobody could decipher and which was not meant to be arty. But the day never came when I was ready to sit and go through them all by myself. A recent planned visit to my daughter, who lives in Bellingham, a charming city north of Seattle, seemed like a perfect time to go through the bin with the only other person who would know and maybe care about all those images. She was game for the task, as she tends to be for most things, and so I arrived with the bin and the intention to be thorough in our approach. We laughed and cried at images of our beloved Newhart, the Golden Retriever, we raised to be a Guide Dog puppy and who came back to us as a ‘Career Change’ dog. We pored over photos of gatherings where neither of us could remember who some of the people were but we knew we had a great time. We talked about my parents, now both dead, and about our memories of them: my mother’s fabulous scarf collection, my father’s famous Drunken Turkey. My piles included images of the two of us through the years; my family including photos going back to family trips – there I was in camp shorts staring bemused at the wooden stocks in Williamsburg, Virginia; and photos of friends I’ve kept throughout the years. We tossed away stacks of prints with people and events that neither of us could remember and some we wanted to forget. 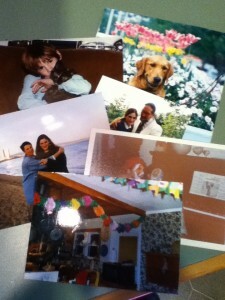 Once home, I called some of the friends whose photos dated back decades and met with them to share. We laughed at how we looked – definitely younger – and remembered our lives at the time, enjoying the good memories even when the people and circumstances had passed and changed. I gave some of the photos to my friends to keep as reminders of our connection and of the past. It reminded me of how deep and long many of my friendships are and how important it is to honor the years and the love we share. 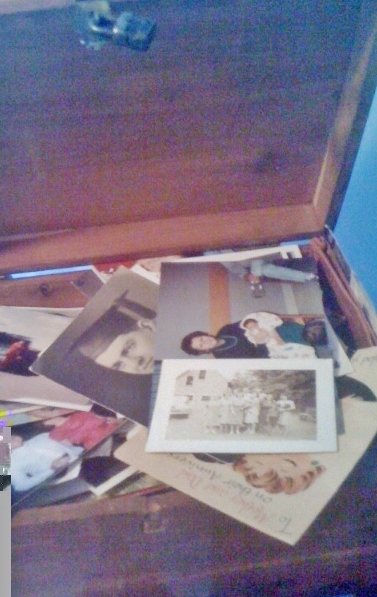 So if you have a stack of photos in a box or envelope, tucked away waiting for the ‘right’ time to sort through them, find someone else who shares your history and go through them together. The process not only brings back the past; it rolls it up to the present. Digital photos are fast and certainly numerous. But their very ease and number make them less precious, less chosen. I am glad the bin in the back of the closet is gone. But the best part was the shared time I spent with my daughter and with my friends. And I doubt that will ever happen again.